You've heard that WordPress is popular but you don't get what all the hype is about? Some of the bigger sites like New York Observer, New York Post, TED, Thought Catalog, Williams, USA Today, CNN, Fortune.com, TIME.com, National Post, Spotify, TechCrunch, CBS Local, NBC, and more all use WordPress. If it's good enough to power those site then it should be good enough to power yours too, right? If you ask the pro-supporters they can give you tons of reasons why this number of WordPress powered sites is on the rise. But ask the not-so-tech-savvy folks, you'll get the complete opposite reaction. WordPress is the choice of many because it is user-friendly once it's set up correctly and operational. WordPress allows you the functionality that you wouldn't have had access to several years ago, and you have control over your website. I agree that WordPress is perfect for most business users, but there is always a downside to the up. This reminds me of when I put on my big girl pants and got my first “real” job. I had a few options, and there was one company that I wanted to work for. Not being sure of my choice, I did what I do best, go to dad for advice. As we talked about the opportunity, I convincingly gave all the pluses. He then added the drawbacks of each item I confidently spouted. At the time, I thought it was his way of gently saying don’t take the job. In hindsight, I realized that he wanted to make the decision as clear-headed as possible and to know what I was getting into. Because we tend to focus on the things that allow us to reaffirm our decision and put the drawbacks on the back burner until they insert themselves into our daily lives. I did take the job, and it was great to do so with a clear idea that it wouldn't be all peaches and cream every single day. That while the decision was ideal for that point in time if I wanted to continue to grow and change I had to have a solid foundation to start. So instead of writing a gooey, feel good, you need to do this article I am going to give you the flipside of every plus so you too can go into this decision eyes wide open. There is a whole slew of help out there, everything from Codex and the support forum to WordCamps in your cities. Some of the best and brightest are there to give you the help that you need. But…there is no hand holding for you. Most will give you the snippets of code that you need or the steps to take to fix the issue, but they are not there to do it for you. Not that you need to be an expert coder but you need the confidence to add the snippet into your theme or site. Then there's the conflicting information which can be overwhelming having several viewpoints and fixes for one question. WordPress people are the bomb and super helpful but they are also opinionated so there's that too. The beauty is that the help is there and easy to find, the downside is that there is a lot of information and it can be overwhelming for the beginner user. There is no need to know the code, learn various programs or have a webmaster on staff. I like to say if you can use Word (or Pages for my Mac geeks) then you can use WordPress. And now that Gutenberg has arrived with blocks it's even easier to add content and create articles. Properly installing and setting up the core, well that’s a different story. I have lots of people call me to consult because they are stuck once they decide to use WordPress. Mostly because they want some customizing to their theme of choice or on the flip side, have too many choices to make. Look in the WordPress repository or Google WordPress themes and you have a million or so choices. Add to that, page builders like Beaver Builder and all-in-one options and you can quickly get overwhelmed on where to start. And you don't want to be adding a plugin for every single piece of functionality that you need on your site or worse adding plugins because a theme requires or a guru told you to (which we'll address in a minute). You also need to make sure that the settings are correct, like permalinks and admin email notification along with removing dummy content that WordPress itself installs tend to add. Getting your site set up correctly from the get-go is crucial, and I highly recommend that you have it done for you if you are a complete novice or just beginning. Believe me, when I say it will save you tons of time getting your site up and running. The best part of WordPress is the ease of use; the downside is that setting it up takes a little know-how and planning. Hundred is an understatement. A shitload would be more like it. There is a plugin for most anything. That saves you custom coding so that you are able to book an appointment, gather a testimonial or add a shopping cart. But too much of a good thing can be harmful. With each plugin, there is a chance that it can “break” your site and conflict with another. Some are resource hogs that will slow your site down. Others can be poorly coded and cause problems. And some have been created five versions of WordPress ago which means while it may provide a useful function it won't play nice with your version of WordPress. And just because there is a plugin to install doesn't mean that you should install it. Sometimes end results can be achieved with a simple line of code or some CSS to make it look the way you need it to be. On the flip side of that argument, you also need to be sure that you use all the necessary pieces too. Meaning that some plugins like WooCommerce and Gravity Forms have add-ons to extend the functionality. So for example Gravity forms has an add-on for Stripe and PayPal so you can easily turn your form into an e-commerce option without needing both Gravity Forms and WooCommerce. Having a dynamic website has never been easier but adding too many bells and whistles can cause analysis paralysis for your user or worse slow your site down. Speed is a critical element of a successful website and proper setup will help keep your site sleek and speedy. On top of having a great coded site and optimal plugins, it had never been easier to get some SEO juice to get found on the interweb. From pretty URLs to easy to add links, getting Google to recognize your content is something that everyone can do. But designing your site, adding content and then thinking you are done is a huge myth. Search engines love fresh content, especially when it is targeted to your market and user. WordPress is the perfect CMS for SEO and building websites that rank well with the ability to modify meta titles, headings, categories, and tags. But in order to take advantage of these features, you need basic knowledge of how to properly use heading, categories, and tags on top of having fresh content to utilize these items. The bottom line is that you need to keep SEO going with fresh content. You cannot expect to create a lovely site with all your information, and then let it sit and marinate. Fresh content is the key to ranking. Google love WordPress, well almost. Google loves fresh, and relevant content and WordPress makes it easy for Google to find such content. Because it is open-source, there is no cost to get the files that make up WordPress. There are also many free themes and plugins, so you do have everything at your fingertips to get started. Well, almost everything. To begin you need to put everything somewhere and this is where the free ends. Hosting, while fairly inexpensive, is still a cost. Without a host, you don’t have a site. Enough said. Then add on premium themes and plugins, free just went out the window. Not to mention the help you will need to get everything set up correctly. See where I’m going. To make your site appealing, you need some eye-catching images, a few professional images or you or your products, and some brand guidelines for consistency. Calling all graphic artists and branding experts. How about the copy? Words, without great copy your site will be crap. You need a targeted message, speaking to those who seek out your service without being sleazy or salesy. Send in the copywriters. Not so free anymore huh? WordPress is a free program but investing in your business is not. The downside, you need to invest in your business and gather a team that is going to contribute to making your site work for you. WordPress is the way to go if you want an easy to use and maintainable website. You do need to know that not everything is puppy breath and unicorn farts because it takes work to keep it hip and happening. If you want a web presence that you have control over and can easily make changes to the look and feel, WordPress is your choice. You don’t need to be afraid to take the leap or continue to be stuck and overwhelmed. 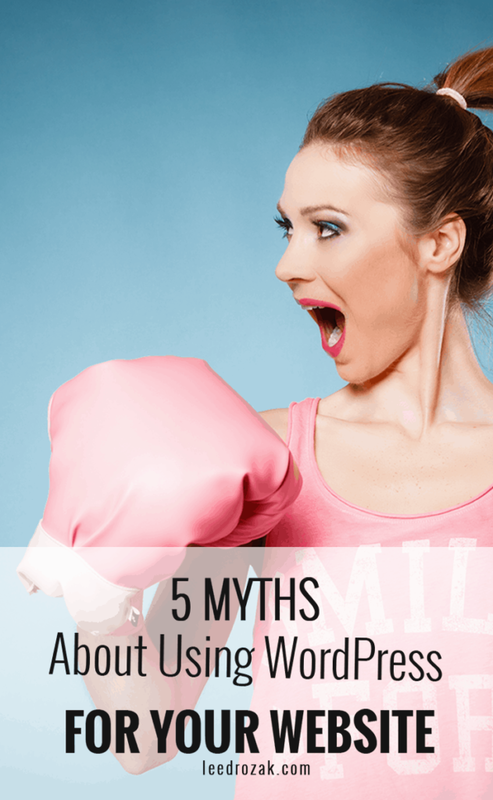 Stop letting the myths of WordPress hold you back from having the site of your dreams. Is this what's holding you back?